Our goal is to make every experience with Illinois Gas Company an outstanding one. That includes your monthly bill, and we work hard to ensure that every customer’s bill is accurate. 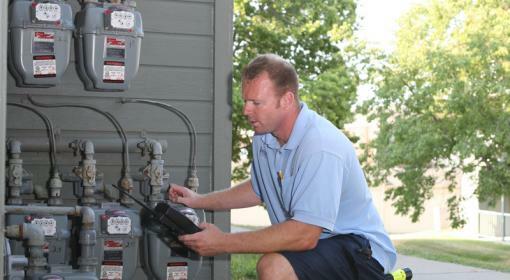 Illinois Gas Company reads residential, commercial and industrial meters every month. Accurate readings ensure that you are paying for the exact amount of natural gas you use, not an estimated amount. If for some reason we cannot read your meter in a given month, you will receive a system-generated bill, which is calculated by considering past usage and adjusting it for exact weather conditions. If a system-generated bill is incorrect, any overcharge or undercharge will be corrected the following month, which means we always bill you only for the gas you actually use. Read only those dials with numbers, starting from the left. If the arrow is between numbers, read the lesser number (the number 9 is less than 0). The reading for this example is 2984. As mandated by federal and state regulations and as an important part of our safety and maintenance programs, Illinois Gas Company periodically conducts a physical survey of our natural gas mains, service lines and meter sets. Sometimes this includes the interior gas piping in your home or business up to the meter. If you recently received a postcard and/or door-hanger at your premises, we were attempting to gain access to our meter set to perform a maintenance check. We checked a portion of our service line on your property but were unable to gain access to your house, building or fenced area to complete the survey. A postcard and/or door-hanger at your premises does not indicate that there is an issue at your premises. However, we do need to gain access to the natural gas meter to complete our maintenance check. Failing to provide access may cause your service to be interrupted. Locked Gate/Fence/Meter Under House — Please leave the gate/fence unlocked. Dog — Please have your dog moved away from the meter set and ensure the dog is unable to approach the technician. Excess Vegetation or Trash/Debris — Please remove the hindrance prior to the attempted read or scheduled appointment. Construction — Please provide a clear path to the meter.